Loughborough University UK are doing a research study looking at the effects of ageing on the structure and function of blood vessels. They are keen to find out how exercise and nutrient intake can influence the health of the heart and blood vessels as we get older with a focus on post-menopausal women. 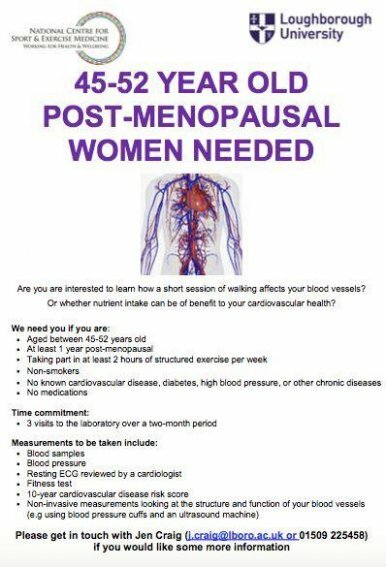 They currently have spaces available for 45-52 year old post-menopausal women who take part in at least 2 hours of structured exercise per week. Everyone who takes part in the study will have the opportunity to have an ECG reviewed by a cardiologist and receive some feedback about their cardiovascular health so it's a great opportunity to get a mini health check whilst contributing to important research. (Please be advised that the study has been reviewed and approved by the Ethics Approvals (human participants) Sub-committee at Loughborough University).